Why and how you should define goals vs objectives carefully? I’ve found that goals and objectives are often defined and used differently within different companies or parts of a business and this can lead to problems when creating processes to track and improve marketing performance. This post gives a short summary of the difference between goals and objectives and why it matters! Typically in businesses you see that objectives are specific, they cover the SMART or SMARTER criteria for objectives which make it possible to set specific targets for a time period and measure against these using sales or analytics systems. That’s the way it should be, I think, this is the de facto standard! But in some businesses or some student case studies, “goals” are used to refer to specific objectives too. Perhaps it’s not helped that confusingly, in Google Analytics, goals are specific quantifiable metrics which are often used as KPIs and link to specific objectives. 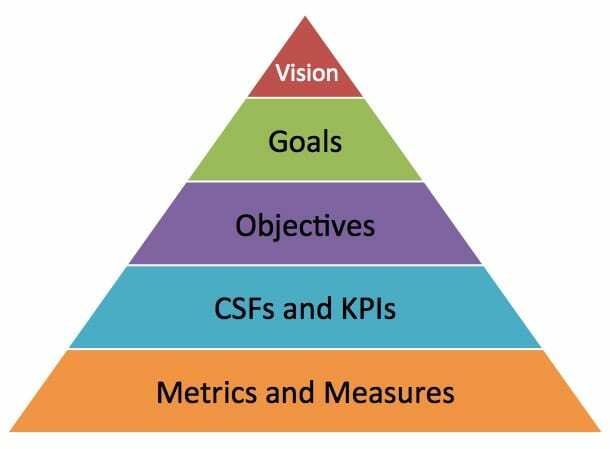 Even Avinash Kaushik of Google acknowledges this can be confusing in his post where he defines goals and objectives. Does it matter if goals and objectives are confused? Probably not, if within an individual company and the agencies they work with, it’s an agreed standard and everyone is clear. What’s most important is that there is a process to review and improve performance and that quantitative targets are set, tracked and can be readily reviewed and actioned through reviewing dashboards or analytics. It’s also useful to create top-level aspirational goals for a business too as Chris Soames shows in his post on 5 steps to clearer marketing goals. Marketing goals are Top-level broad goals to show how the business can benefit from digital channels. So, goals are the broad aims used to shape your digital strategy. They describe how your digital marketing will contribute to the business in key areas of growing sales, communicating with your audience and saving money. Marketing objectives. Specific SMART objectives to give clear direction and commercial targets. Objectives are the SMART targets for digital marketing which can be used to track performance against target. Marketing KPIs. Key performance indicators (KPIs) are used to check you are on track.) KPIs are specific metrics which are used to track performance to make sure you are on track to meet specific objectives. They are sometimes known as performance drivers or critical success factors for this reason. To help show the differences between goals, objectives and KPIs you can show the hierarchy and show that you need a broader marketing / digital marketing Vision too. I hope that's helpful - I think it's more than semantics, indeed there is a tendency to only set general goals rather than specific objectives which makes performance management impossible!